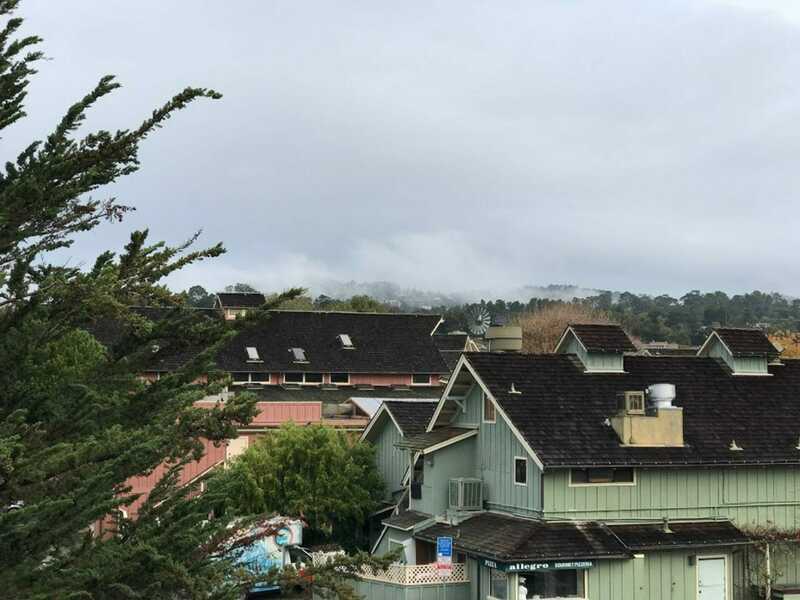 Carmel is an idyllic seaside town that is known for its ritzy, artisy community, dog-loving nature, and picturesque fairytale cottages. Located in the Monterey Peninsula, it’s a quick weekend escape from the San Francisco Bay Area, but feels a world away. It’s a great destination to add onto a trip to neighboring Monterey, or visit just on its own. Here are some of my favorite things to do in Carmel that allow you to get a solid introduction to this seaside city. The best time of the year to go is during mid-September-October when the crowds have decreased, but the weather is still sunny and mild (though the fog can appear at any time so bring layers!). Avoid the wintertime, unless you prefer the rain and cold. When we we went at the end of December, the rain was relentless and our trip consisted of mostly dodging downpours (though the Christmas decorations downtown almost made up for it). Stop by the former home of poet Robinson Jeffers, whose tranquil grounds are thought to have inspired his works. The Tor House is made up of the main home which is designed after an English Tutor barn as well as the Hawk Tower, which is modeled after ancient Irish stone towers. The property is maintained by The Tor House Foundation, a non-profit organization that hosts events like concerts on-site. Small group guided tours are available on Fridays and Saturdays, from 10am to 3pm. Adults are $12, students $7. Reservations required. Carmel’s compact downtown area doesn’t skimp on the charm, with its tree-lined streets filled with shops, art galleries, and restaurants. Stop by Carmel Coffee & Cocoa Bar for a warm drink and an assortment of delicious sandwiches, salads, and soups. Stop by Diggidy Dog, even if you don’t have a four-legged family member at home you can still browse the impressive selection of treats, clothes, and toys that are for sale (and dream about buying things for your future dog). Wander off onto side streets to explore the hidden courtyards and secret passageways throughout the downtown area. For a front row seat to nature, this state park nature reserve offers wintertime whale watching and year-round sea lion spotting against a panoramic coastal backdrop. There’s also plentiful opportunities for hiking, bird-watching, and scuba diving. Free guided walks with different focuses (habitat, family-oriented to name a few) are offered daily, check out the schedule here. There is also an informative Whaler’s Cabin Museum (open 9am-5pm daily), which provides insight into the early life of settlers in the area, including the Chinese fisherman who called the coast home. Plenty of parking, as well as picnic tables on-site. Park hours are 8am – 7pm daily, with the last entry at 6:30pm. At the end of Ocean Drive, this postcard-perfect beach is ideal for taking a stroll on its white sand, with cypress trees lining the beach. The beach is dog-friendly, and you’re bound to see some of the happiest dogs here frolicking in the surf. Come here early in the morning for quiet reflection, or later in the day if you want a more lively atmosphere when the beach come alive with tourists and locals. If you’re lucky you might catch a whale or two breaching, depending on the time of year. Parking is plentiful, but you may have to fight for a spot if you’re here during tour bus season. Restrooms are available. This one-mile long protected beach and lagoon is known for its scenic coastal views and prime bird-watching for flocks of migratory species. This is a quieter alternative to Carmel Beach, even in the summertime, if you want to escape the crowds. The surf is wild and dangerous here, despite this area being a popular scuba diving spot. Being a state beach, there’s is plentiful parking, and clean restrooms. If you’re in the beach-hopping mood, start at Carmel Beach and then take Scenic Drive along the coast, with this state beach as your finale. Explore some of the city’s history through one of the state’s oldest missions. Its beautifully restored Roman Catholic church-style chapel is not to be missed and is one of the most authentically restored mission churches in California. The church is still in use for local worship services, and community events like concerts and lectures. The mission serves as a museum with four separate areas, including the cell where Father Junipero Serra, the founder of the California missions, lived and died. There are guided tours, as well as self-guided tours as well. Admission is $9.50 for adults, $7 for seniors, and $5 for children. To get a taste of this rich art-centric community (director/actor Clint Eastwood was a former mayor), head to this performance center that offers top-notch concerts, dance performances, and plays. The center is also home to a nationally recognized arts education program, where local students of low-income neighborhoods can come for lessons free of charge. The venue itself is massive with 500 seats and easy on the eyes with large glass windows and high ceilings that provide excellent acoustics. Check out the event calendar here. Carmel is not a cheap destination, especially if you want to stay near downtown where all the action is. That being said, there are great mid-range options that provide central locations, as well as numerous amenities that will make it feel like home, if you know where to look. A mid-range hotel that is in a central location-walking distance to downtown as well as the beach. Amenities include an outdoor pool, free parking, and rooms with an ocean view. If you’re looking for a reasonably-priced spot that doesn’t skimp on its amenities, this is a solid option. Free breakfast is included. This central location is a 7-minute drive to downtown, and has the Carmel Mission as well as the Carmel River State Beach within a 10-minute drive from the property. Amenities include an outdoor heated pool, a whirlpool spa, an indoor lounge with a fireplace, and a courtyard with wooden tables and outdoor fire pits. The Fuse Lounge, a restaurant/bar is also on-site. A two-story boutique luxury hotel that pulls out all the stops, and is just a few blocks from Ocean Avenue, and a quick walk to Carmel Beach. This newly remodeled hotel offers modern beach charm throughout the property, including a cozy courtyard fire pit, and more than half of the rooms boast a fireplace that you can unwind in front of with a glass of wine. What are your favorite things to do in Carmel?